You don’t need to spend a fortune remodeling your bath, just a few changes, a little bathroom decor, and you’re on your way to a beautiful bath that you’ll enjoy for years to come, without the expense of a remodel. Many homes have overlooked and dingy bathrooms in spite of the fact that your bathroom is possibly your homes most often used room. In general, all bathrooms from the children’s bath to the luxurious spa benefit from good lighting, good ventilation, plenty of storage, and fittings and fixtures that are as practical as they are attractive. Avoid brightly finished chrome if you have kids and don’t want to spend a lot of time cleaning. Safety measures are important too. Safety measures are always a good idea, especially when there are young children or elderly people in residence. Grab bars, no-scald faucets, rounded corners on counters, and slip-resistant surfaces benefit are all important considerations. The shower is an excellent place to begin. Try replacing your old shower head with a luxurious multi head spa shower head, or a waterfall rain shower head. There are a large variety of showerheads for you to choose from. This provides you with an affordable way to upgrade your bathroom without the expense of hiring a plumber to change the plumbing behind the shower and bathroom walls. Nothing is quite as invigorating or relaxing than a shower, assuming you have a great shower head. Install new faucets along with a new shower head; add some new towels and perhaps a coat of paint. Thoughtful touches like a shaving mirror mounted above the sink, towel warmers, and hand-held shower heads are always appreciated additions. You may be quite surprised at the difference it makes in the appearance of the room. Choose light-reflective materials such as maple cabinets, stainless-steel sinks, and polished-chrome faucets to keep a contemporary bath looking airy. White wainscoting and white brick tile will have a similar dazzling effect in a traditional room. Carefully chosen color schemes can make a bathroom look larger than it is. The use of soft pale colors on the floor and walls have the same effect. This holds true for bathroom fixtures. Use soft, pale colors, and then add decorative touches in strong, bold colors to give the illusion of greater space. And while you’re at it, get rid of the clutter. Baskets are a good way to hid clutter, and less clutter ads to the feeling of space. Consider putting up a picture in the bathroom that is a scene of an outdoor garden or beach. This gives the illusion of looking out a window and seeing open space. Bold colored towels can help a great deal. Bathroom accessories should also be strong in color, and try to avoid rich, dark woods and flooring. The use of glass is another way to give the illusion of space. Get rid of the frosted shower doors and curtains. Install new seamless glass doors for the shower, and you’ll be surprised at how much larger a room can seem. Glass is reflective, and when used for things such as shelves can really improve the look. Incorporate the old trick of putting mirrors on opposite walls so they reflect back and forth giving the illusion of added space. If you don’t need the storage space, replace your vanity cabinets for one of the new glass pedestal sinks. You gain some space, and add the illusion of extra space. Lighting always helps make a room look larger, and if you add recessed lighting, you can point this light at specific areas, such as the vanity. However be careful, excessive focused lighting can quickly heat up a small space. Lighting is very important in bathroom decor. 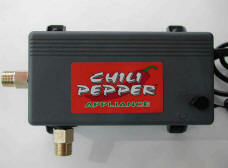 The Chilipepper works with any kind of water heater including tankless water heaters, and solar water heaters. It pumps 2-1/2 to 3 gallons of water per minute, more than enough to turn on an instantaneous water heater. No water gets run down the drain!